For the brand of cars, see Jaguar (car). The Jaguar (Panthera onca) is a large feline (big cat) which lives in South and Central America. The jaguar is the third-largest feline after the tiger and the lion. It is also the largest and most powerful feline in the Western Hemisphere. Because of its spots, jaguars look like leopards, though it is usually larger and stronger, and its behavior is more like that of a tiger. It likes to stay near water, and like the tiger, it is famous for being a big cat that enjoys swimming. It usually hunts alone. The jaguar has a very powerful strong bite, even compared to other big cats. Because of its strong bite, jaguars can bite through armoured reptiles like caimans, crocodiles, turtles and tortoises. Jaguars kill their prey in an unusual way: they bite directly through the skull between the ears and into the brain. In American English, the word jaguar is pronounced /ˈdʒæɡwɑr/. In British English, it is /ˈdʒæɡjuː.ər/. Jaguars have yellow or sometimes yellow-orange fur with brown and black rosettes and spots. They are big and heavy and also have very strong muscles which makes them really powerful. Sometimes there are jaguars who are completely black, but if you look closely you can still see the spots. They are called "black panther" or just "panther". This is a 'colour morph' of the same species, a kind of polymorphism. Jaguars live in South and Central America. They mostly live in rainforests, but also in savanna, swamp and open areas. They cannot climb well, but they swim very well. Jaguars are not specialized with their food, but eat almost anything they get: big and small mammals, birds, reptiles, fish and livestock. It is an ambush predator. When hunting, they usually try to secretly get very close to the prey, and then the jaguar suddenly jumps at it and throws it down. The jaguar bites the skull of its prey to kill it. It then takes the prey to a safe place and eats it. After a pregnancy of about 100 days the female gives birth to usually 1 - 4 babies. The young leave their family after 1–2 years, and they become mature at about 3 years. Jaguars can live up to 10–12 years old in freedom, but in captivity (such as in zoos) they can live to 20–22 years old. ↑ Wozencraft, W. Christopher 2005. Order Carnivora. In Wilson, Don E., and Reeder, DeeAnn M., eds. Mammal species of the world: a taxonomic and geographic reference. 3rd ed, Baltimore: Johns Hopkins University Press, 2 vols. pp. 546–547. ISBN 978-0-8018-8221-0. OCLC 62265494. http://www.bucknell.edu/msw3. ↑ Nowell, K., Breitenmoser, U., Breitenmoser, C. & Jackson (2002). Panthera onca. 2006 IUCN Red List of Threatened Species. IUCN 2006. Retrieved on 11 August 2006. Database entry includes justification for why this species is near threatened. ↑ Stephen Wroe, Colin McHenry, and Jeffrey Thomason (2006). "Bite club: comparative bite force in big biting mammals and the prediction of predatory behavior in fossil taxa" (PDF). Proceedings of the Royal Society B (Royal Society) 272 (1563): 619–625. doi:10.1098/rspb.2004.2986 . PMC 1564077 . PMID 15817436 . Archived from the original on September 21, 2006. http://web.archive.org/web/20060921111410/http://www.bio.usyd.edu.au/staff/research/swroe/Wroeetal2005Biteclub.pdf. Retrieved 2006-08-07. ↑ Hamdig, Paul. "Sympatric Jaguar and Puma". Ecology Online Sweden via archive.org. http://web.archive.org/web/20080201022320/www.ecology.info/ecology-jaguar-puma.htm. Retrieved 2009-03-19. 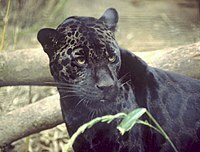 Wikispecies has information on: Jaguar. This page was last changed on 19 September 2014, at 14:37.